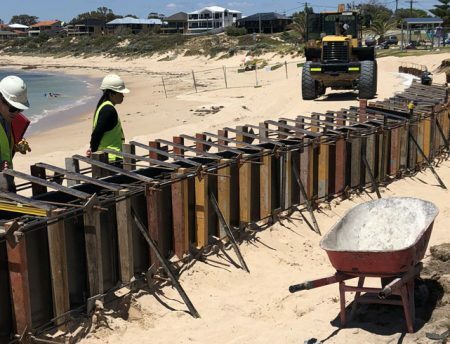 Leeuwin Civil was engaged by the City of Mandurah to Design and Construct a seawall at Falcon Bay Beach in the Shire of Mandurah. Design works for the project were undertaken by WML Consultants with structural design analysis performed by marine and ocean experts, BMT JFA Consultants. The final design included a 65m long sheet-pile-wall, some areas being 6m in depth, with 5m long return flanks. The flanks were topped with concrete ring beams – and a set of stairs, handrails and tactiles installed to provide beach access from the path. A smaller concrete tie-beam connected the revetment mattress to the wall which was then backfilled and covered with beach sand to provide coastal wall erosion protection. Construction was mobilised at 100 per cent with all works completed within time and budget constraints. installation of stairs, handrails and tactiles for beach access.